Looking to clean and organize your home and make some extra money? Consider de-cluttering your living space. Believe it or not, people will pay for your old and unused items, regardless of their condition. You might think that having a garage sale is the best way to get rid of unwanted items. However, having a garage sale should be your last resort for moving clutter. A garage sale isn’t the most productive way to get rid of your unused items, and you have other, better options to use to get your home organized. If you live in an apartment or condominium or belong to a homeowners association, you may not be allowed to have a garage sale. Many communities have strict restrictions regarding garage sales. Some communities only allow them during certain times of the year, and some communities only allow residents to have a certain number of sales each year. Many communities have signage restrictions, too. Having a garage sale involves a significant investment of time. To have a successful garage sale, you must hold the sale all day Saturday and Sunday. You must also spend additional time on planning, advertising, and cleaning up once the sale ends. The entire process can easily take 30 hours to complete. Think about whether you can afford to invest an entire weekend or more into the project. When you consider all the different ways that you can eliminate unwanted and unneeded items from your household, the return on investment from a garage sale rests at the bottom of the list. The time it takes to advertise, plan, and stage the sale just doesn’t merit the amount of money you earn from selling your items. 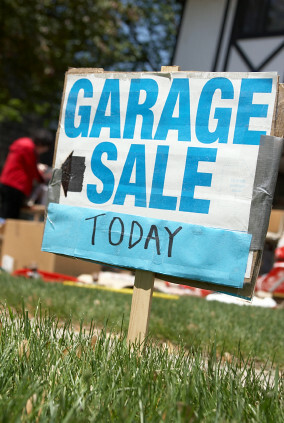 You can make money from your unused items by using smart alternatives to garage sales. You won’t see an immediate return, but you may make more money by donating the items and receiving tax deductions for charitable contributions. In addition, when you donate your items, you can actually achieve the goal of decluttering your home once and for all. This option also has the feel-good effect of knowing that you can help others less fortunate than yourself. Remember, many people would be thrilled to have your gently used household goods or clothing. You can donate your items to nonprofit associations like Goodwill or Salvation Army, or bring them to a church or school rummage sale. Sell Items Online. You can use online outlets like Amazon, Craigslist, and eBay to sell your unused items. You don’t need an account to sell items on Craigslist, and you can set up a seller’s account on Amazon or eBay in just a few minutes. Take a few photos of your items, upload them, and write a brief description of the items to get started. Sell Items at a Flea Market. You can rent a space at a flea market for a small fee. You’ll get a lot more foot traffic than at a garage sale. Sell Unused Items at Consignment Stores. You can sell your items at consignment stores. You may have to pay a small fee to consign your items, and you split the profits with the store. The profits you can make when you sell items online, at a flea market, or at a consignment store will definitely beat the frivolous offers you receive by trying to sell your items at a garage sale. Selling through other means will likely attract a much great number and variety of potential buyers. For example, some online sites will get your products in front of millions of potential buyers. Yes, there may be fees involved, but you will likely command a much higher price due to the increased buyer competition. Also, in this day and age of technology, many people simply do not have the cash on hand to make large purchases. Moreover, many prefer to use credit cards due to some of their rewards; for example, the best cash back credit cards can offer up to 5% back, which will ultimately make your products seem cheaper to them. Take advantage of non-traditional means of selling your used items and you can get a much great return on your initial investment! I’m sure that many of you have had successful garage sales. I, however, have never had much success. I encountered a number of problems when I held my last garage sale. Garage Sales Are Frustrating. I had several unused button-down dress shirts still in their packaging priced at a dollar each. After several people stopped by and offered me fifty cents for each shirt, I just took them back inside. Garage Sales Are Too Time-Consuming. The garage sale that I held lasted an entire Saturday and Sunday. I sat in a lawn chair in my driveway for 16 hours, and made a mere $100 for my efforts. The time it took to have the sale doesn’t include the time I spent assembling, cleaning, and pricing all the items. Garage Sales Are Exhausting. I found it exhausting to plan, advertise, and hold a garage sale. I had several bulky items for sale, including a dresser, a couch, and a desk, and after hauling them in and out of my house on Saturday and then again on Sunday, they didn’t sell. I had to load these items a third time when I finally decided to donate them. In the end, the entire process of staging a garage sale seemed too time consuming, too frustrating, and too tiring for me to ever consider having another. More profitable and streamlined ways to get rid of your unused items exist, and they take a lot less time and energy. What are your thoughts on garage sales? How do you get rid of unwanted items? David Bakke lives in Atlanta and writes about his journey managing his personal finances on Money Crashers. I have never had a garage sale. They seem like so much work. I have also read where people show up hours ahead of time hoping to get deals ahead of time and such. I would much rather donate, that is for sure! I had a garage sale about 10 years ago and it seemed easy enough. Now the thought of all the work involved seems pretty daunting. Of course, I didn’t use Ebay and Craigslist then! I donate now unless it’s an item that is really valuable (more than $50). If so, I sell it. I’ve never had a garage sale, I feel like selling online is more profitable. Michelle, it probably is but some people still don’t aren’t comfortable with online transactions (hard to believe, isn’t it?). We’ve had our own garage sale and participated in a couple of friends g. sales. I strongly agree with the donation suggestion. Enjoyed the post. Melissa, if you can have it at the same time as your neighbors you’ll get more traffic and it seems more fun. You’re all in it together! We may have had our very last yard sale last year. This year, whatever we have to declutter out of the attic is going straight to Goodwill. *Going* to yard sales, on the other hand, is still on the menu. Next post: A Roundup of Carnivals and Link Love!